Blockchain technology has been filling up news feeds around the globe all year. It's yet unclear whether blockchain is the future of finance, or a bubble waiting to burst, but professional services and consulting firm, Capgemini already has some great ideas about how the technology can be applied to the supply chain industry. Capgemini was founded by Serge Kampf in 1967 as an enterprise management and data processing company. The business was originally named Societe pour la Gestion de l'Entreprise et le Traitement de l'Information(Sogeti) - Society for the Management of Enterprise and Information Processing. Over the next five decades the company expanded aggressively, acquiring nearly 30 other brands. Today, the Paris based Capgemini, employs over 190,000 staff, and enjoys a market cap of $15.7 billion, placing it at #233 on Forbes' list of top multinational performers. In its role as consultants, Capgemini needs to be constantly assessing new technology, such as blockchain, and deciding whether it could be of benefit to its clients. At its core, blockchain refers to technology which allows for transactional data to be stored independently of any third party governing body. 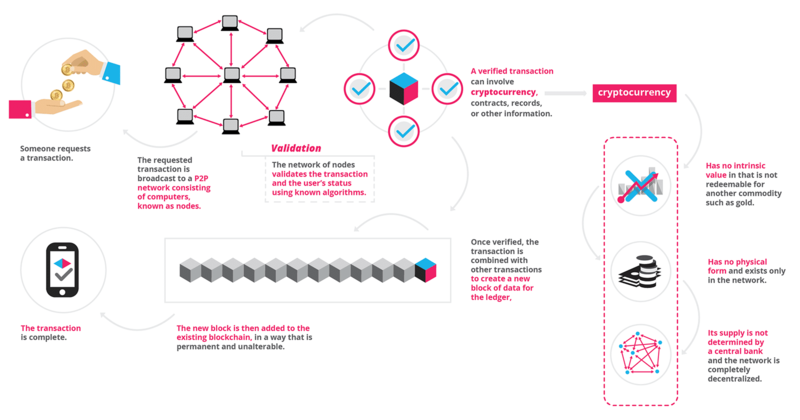 Transactions are stored in so-called blocks, with a sequence of transactions making a chain - hence, blockchain. A network which uses blockchain technology can therefore take over roles and functions which up until recently would have required a centralized and trusted database or platform. Blockchain allows two parties to carry out transactions, with the trust which is usually provided by the central mediator, instead provided by encryption and verification processes. It is this transparency, security and trust - as well as the time, resource, and money savings - which could make blockchain technology ideal for the supply chain industry. "Blockchain technology for itself doesn't generate any benefit for supply chain management," says Management Consultant for Digital Supply Chain Management at Capgemini Consulting, Daniel Heinen . "The question raised is therefore: for which desired future processes could this technology be the enabler?" When it comes to the food industry, the ability to trace the source of ingredients is becoming an increasingly important concern for consumers and businesses, and one which often drives their purchasing decisions. Blockchain technology lends itself naturally to this as all transactions are stored in sequence. This means the entire supply chain, from raw ingredients to the finished product, can potentially be traced using blockchain technology. Similarly, the ability to trace the journey of transactions, and the inclusion of timestamps, can create safer exchanges for businesses. This makes the exchange of business documents, orders and confirmations, the transfer of shipping information, etc. a far less risky process. "Creating consistent traceability of goods will remain a major objective for future supply chains," said Heinen. "To achieve transparent and reliable documentation of all transactions, end-to-end communication in supply chains must be taken to a new level of maturity. In reality, most networks already fail at the creation of communication or data exchange between the members as well as on legal questions about data sovereignty." Capgemini are presently working with IBM at their Watson IoT center to create a smart container management system based on blockchain technology. Sensors built into the container can detect changing factors such as temperature or pressure, and transmit this data to a central platform. Using blockchain technology this data can be accessed by every link in the supply chain, and any measurements falling outside of contractual parameters can trigger previously agreed upon penalties. Heinen says, "At every point in time, the product's history and its place of origin are uniquely identifiable, and additional information (e.g. on compliance with the required cool chain of goods) can be secured. In this concept it is imaginable that reactive processes are automated by 'Smart Contracts.' If there is a negative effect on the goods, posing a breach of contract, processes like an insurance proposal or a contractual penalty for the forwarder can be triggered automatically." Even though the future of blockchain technology as a purely financial facilitator is still very much up for speculation, it is reassuring to see innovative companies, such as Capgemini, already exploring interesting ways to apply it to the supply chain industry. With the links in both a supply chain, and a blockchain being naturally congruent with one another, it has huge potential for the industry. The final word goes to Capgemini Consulting's Management Consultant for Digital Supply Chain Management, Daniel Heinen. 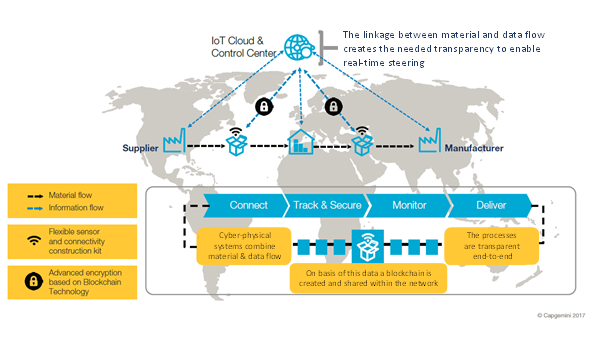 "The usage of 'Smart Containers' through the entire network has the potential to transform supply chains into highly integrated smart supply chains in which supply streams can be simulated virtually. This integrates physical processes and enables automation. The result is complete end-to-end transparency and transformation of the supply chain into an agile cooperation network. This offers the possibility to break down the existing information silos between members of the supply chain, and fosters efficiency and collaboration." You can hear Capgemini's North American Chief Procurement Officer, Vitold Horodecki , speak at ProcureCon Canada 2018 in April, at the Hyatt Regency Toronto, Ontario.